The Dante Stakes this Thursday may prove to be an important indicator for the fortunes of Godolphin’s fancied runner, True Story for the Derby next month, as the Saeed bin Suroor-trained horse is tipped to run in the Dante Stakes, where he starts as favourite. True Story’s participation in the race is still not confirmed, however, as his stable will wait until the last possible moment to see whether the soft conditions improve in time for the race. The best place to have a bet on the 2014 Dante Stakes is with Bet365.com. The odds below were taken from the site, and you will be able to find the latest race odds there as well. Bet365.com is also offering each-way betting on the race, with which you will receive 1/4 if should your selection place in positions one to two. True Story is not the only horse possibly to be removed from the race on Thursday, however, as Peter Chapple-Hyam’s Arod is also at risk of pulling out due to the soft ground, which would leave the race with just the four runners. ‘It needs to dry up a bit,’ he said. ‘He is in at Newmarket on Saturday, but I would sooner go to York if I could.’ The weather for the next three days is expected to be dry, though, so this may not be as big a problem as previously expected. All eyes will be on True Story if he does race, though. The second favourite for the Derby at this stage, he has been impressive in his three race starts, most recently in the Feilden Stakes last month, where he was very convincing. Bin Suroor knows that this will be an important test for his runner, as he kicks up preparations for the Derby: ‘He is stepping up from a Listed to a Group 2, so we will see how good he is,’ the trainer said. The second favourite for the race, Bunker, who will become the default runner should True Story drop out, is definitely on course for the race, on the other hand, and trainer Richard Hannon is confident the track will improve over the next few days. ‘He’ll be OK, it was nearly soft at Haydock the first time he ran,’ the trainer said. As mentioned above, the best racebook to place a bet on the 2014 Dante Stakes is Bet365.com, who will offer the best odds on the race. When visiting Bet365.com, click on ‘Horse Racing’ in the left sidebar and scroll down to the Antepost section of the page, where you will find the markets for this race and many more. 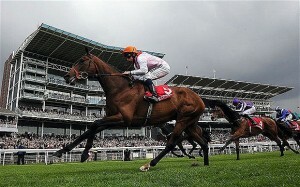 The Dante Stakes is a Group 2 race held at York Racecourse in York, England. The race is run over a distance of 2092 metres and is for three-year-old horses. The race offers GBP 150,000 in prize money, and was won by the Elaine Burke-trained Elaine Burke-trained Libertarian in 2013.